When Kamal Gangrude looks across at the fields beside her home on the valley floor, she sees swathes of farmland which this year will not be weeded, ploughed or planted. Sold to developers who will build factories and roads or generally put it to non-agricultural use, the loss of this farmland has also meant a loss of vital labouring jobs for the Dalit families of Pimplad, a village in Nashik district of Maharashtra. 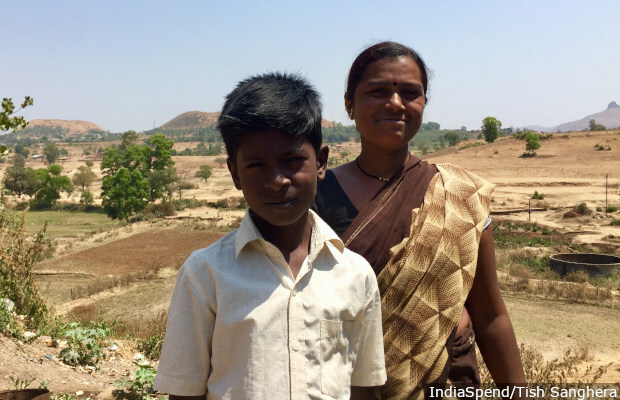 Kamal Gangrude, 35, with her son in Pimplad village of Maharashtra's northwestern Nashik district. In the backdrop are the fields that used to provide a steady supply of farm jobs, but have now been sold to developers, thus restricting employment options for the village’s poor. 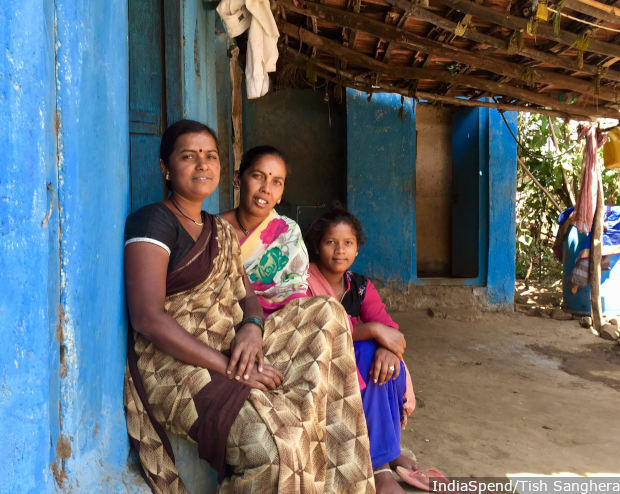 Like the villagers of Pimplad, an increasing number of women in Indian villages are being left with little employment options, except low-paid and erratic farm work. The number of female agricultural labourers in India increased by 24% between 2001 and 2011, even as 7.7 million farmers left farming, indicating how any limited, non-farming opportunities are increasingly being taken up by men, who are perceived as higher-skilled, better educated and more able to migrate for work. This ‘feminisation of agriculture’ is “not to be celebrated”, said Ishita Mehrotra, assistant professor at Ambedkar University, Delhi, because farm jobs keep women confined to “low paid, insecure and oppressive labour relations”. 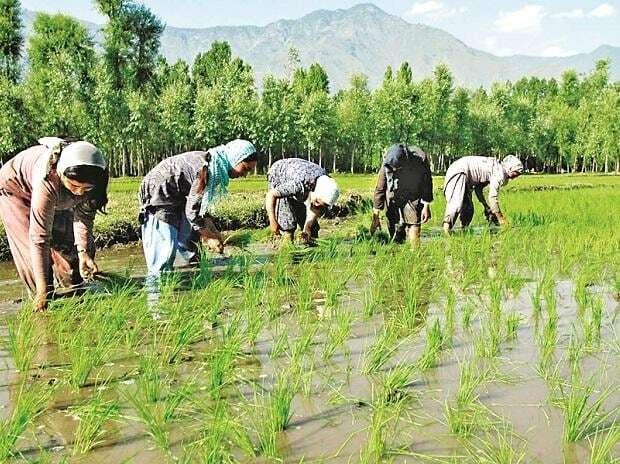 Agricultural work is indicative of “a patriarchal ideology and a socio-cultural value system” that keeps women bound to the village and consumed with domestic work, while gender roles allow men to migrate for economic and social reasons, she said. Mehrotra has authored a chapter on rural unemployment and inequality in Oxfam India’s second India Inequality Report, ‘Mind The Gap – The State of Employment in India’. This is the latest in our ongoing investigation of India’s jobs scenario, and is based on Oxfam’s analysis of the jobs situation in its new report and our investigation from the field. Despite four-fold growth in gross domestic product (GDP) since the early 1990s, India’s rural economy has undergone a crisis, with women and marginalised groups suffering the most as income-generating opportunities have disappeared. An estimated 32 million casual labourers lost their jobs between 2011-12 and 2017-18, with 94% of those being farm jobs, according to a leaked National Sample Survey Office (NSSO) report published by The Indian Express in March 2019. At the same time, the proportion of employed rural women fell by 31% from 2011-12 to 2017-18, compared to a 6% reduction in employed men, reflecting how women have fared worst in the economic crisis. Amid such turbulence, the country has seen numerous farmer protests, rising debt levels among rural households and falling crop prices, leaving the 600 million Indians dependent on farming struggling to get by. As a result, rising unemployment and agrarian distress have become salient election issues, with more than 70% of people in a recent survey citing a lack of jobs as a significant concern, IndiaSpend reported in March 2019. Non-farm activities now represent more than 65% of rural household incomes, as agriculture as the main source of income becomes gradually less prevalent, according to this 2017 paper released by Niti Aayog, the government's policy think-tank. This reflects the way workers have had to diversify out of traditional, farm-based employment, as opportunities have shrunk. The need to find alternative employment affects the working poor (who also are more likely to be Dalits, Adivasis and Muslims) significantly more than the upper-caste, landowning classes who can rely on trade and renting out of machinery, as examples of asset-backed wealth generation, the Oxfam report found. Wealthier rural households are also more likely to find skilled, white-collar jobs as a result of higher education levels. As farm workers leave an unproductive agriculture sector behind in search of new and better employment, “who gets what job and under what conditions” remains governed by “unequal power relations” that are a norm in rural labour markets, the report said. For example, 29 million rural women have vanished from the labour market between 2011-12 and 2017-18. When labour markets constrict and demand for jobs heightens, women are more likely to lose out, especially in rural construction jobs, said Ritu Dewan, former director & professor at the department of economics, University of Mumbai. A lack of employment options and an increasingly desperate situation can also mean a greater chance of exploitation amongst marginalised groups, the report found. As the non-farm sector becomes “the single most important source of alternative employment” and many men migrate for work, women are left to bear the burden of keeping households running. For low-caste Dalit women this can mean taking up low-paid, and sometimes even unpaid, labour, in return for social security provisions by upper-caste landowners, Mehrotra explained. For women there can be an added layer of sexual exploitation too, as a condition for securing employment, Dewan found during her fieldwork across labour nakas (hubs) in rural areas. “Before you would see groups of waiting workers divided by skill, language and of course gender too; but now in the past two years and especially post-demonetisation a new division has emerged amongst the women,” she said. Operating with the upper hand as demand for jobs has decreased, employers have been asserting their bargaining power to divide the women on the basis of sexual attraction, with “the younger and slightly less-malnourished” separated from older women, said Dewan. A reduction in the number of rural jobs is also translating into a decrease in the quality of work that remains, creating a “highly mobile and fragmented” workforce, the report said. Many workers (a group largely represented by the Scheduled Castes, the official name given to the lowest castes in India and regarded as the most socially disadvantaged), have a ‘multi-occupation’ existence, in an attempt to make a living through a mix of irregular casual labour, petty self-employment and migrant work. While such work may pay more than agricultural labour, it still comes “no way close to providing a decent regular wage”. Indeed, the proportion of Indians expected to be involved in such ‘vulnerable employment’ is estimated to be around 77% by 2019, five percentage points higher than the South Asia average. This is an indication of the extent of the livelihoods crisis in rural India, said Jayati Ghosh, professor of economics at the Centre for Economic Studies and Planning at the Jawaharlal Nehru University in Delhi, “where it’s hard to get enough days of employment or even full days of work in most activities, and no single activity is enough to provide a decent standard of life”. While the negatives of such insecure working conditions are clear, Ghosh also pointed to a more worrying trend of an increasing wealth gap between “those with sufficient assets (like land and other wealth) as well as those with proper regular jobs (local bureaucrats, school teachers on regular payrolls, etc) and the rest”. That rural job markets have been narrowed and it is poor, marginalised workers that are getting left behind is a situation that Mohan Kankate knows only too well. Pointing to large bungalows in the far-off fields, the 23-year-old narrates how the village landowners left some 10 years ago to build new, larger homes outside the boundaries--a visual display of how the two communities’ fortunes have fared over recent decades. “I would say around 20% of the young men around here are working,” he said. “It is possible to find work in the city but no one really wants it--you earn Rs 6,000 per month but you only end up taking home Rs 2,000, and after such long hours and hard work as well.” As a result, many of the village’s youth are more often seen drinking alcohol and playing cards during the day, than seeking out an unappealing alternative. 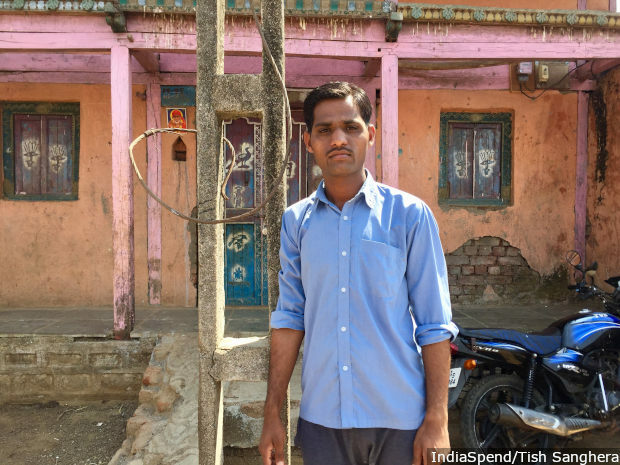 Mohan Kankate, 23, and a resident of Pimplad, a village in Nashik district in northwestern Maharashtra, says only about 20% of the men in his village are employed. Most others spend their days drinking alcohol and playing cards. While up to 34% of men in rural areas have migrated in search of employment and better economic opportunities, the figure for rural women is about a tenth at 3.6%. Though out-migration can provide access to economic and social mobility, such options remain out of reach for many women in rural India due to “a patriarchal ideology and local socio-cultural traditions” that confine them to the village, the report found. Sitting on the raised steps outside her home with her neighbours for company, Bharti Chabilal, 32, explained how women’s lower education status and the need for monetary investment mean it is mostly the village’s menfolk that can migrate for work to towns and cities. “Each journey costs Rs 50 so not everyone can go. If anyone is going to travel into the city then and look for work, it will be the men,” Chabilal said. “They are more skilled and so more likely to get the job,” adding that she and many of her female peer group are only educated up to the 8th standard, while the men in the village mostly completed school, leaving after the 12th. Norms assigning the burden of domestic care work like child-rearing, and time-consuming tasks like firewood and water collection, also mean few women are able to explore opportunities outside the village. This further entrenches their low socioeconomic status and exclusion from paid labour, the report said. Chabilal, for example, said with her list of household responsibilities that take up a large portion of her day, she has no option but to remain close to home. “We just go between our village and our parents’ village, rarely anywhere else,” she said. “We don’t get to hear about any available jobs in the area either, as the men do,” she added. Bharti Chabilal, 32 (centre), with her neighbours sitting outside her home on a hot March afternoon, in Pimplad, a village in Nashik district in northwestern Maharashtra. While their husbands are able to migrate to nearby towns and cities in search of work, women like her have to stay behind due to the burden of household chores and a lack of education that reduces their chances of finding skilled jobs. Her experience is common to many Indian women in rural areas, unable to join migration flows and find suitable non-farm employment, leaving agricultural labour as the sole option. While overall rural employment is becoming de-linked from agriculture (only 30% of rural households depend on cultivation as their main source of income), this is not the case for women, 75% of who are currently engaged in low-paid and unskilled agricultural work. Not only are more women becoming concentrated in a form of labour that provides an “insufficient” source of income, but they also continue to face multiple forms of discrimination that indicate “wage relations are not just an economic contract”, the Oxfam report said. The gender pay gap, for example, among male and female rural casual workers is currently estimated at 45%, 10 percentage points higher than the national average of 34%, as IndiaSpend reported in August 2018. Multiple women in Pimplad village confirmed that for men the daily wage rate for farm labour was Rs 50 higher than for women (Rs 250 vs Rs 200). “I’ve never really thought about it but I suppose women should be paid the same as men,” Gangrude, who we met earlier, told us. “But if you ask for more money they just tell you ‘don’t come’.” They use the fact that men do more heavy-lifting as the reason for paying them more, she told us, “but we are all doing the same amount of hours”. When women are able to find alternative and limited off-farm opportunities, for example in home-based work, discrimination follows them. Their wages, skills and participation are all determined by “local value systems and patriarchal norms”, the report said. The government's Mahatma Gandhi National Rural Employment Guarantee Scheme (MGNREGS) has helped provide some non-farm employment to women in areas where previously they may have been excluded, such as construction, the report said. The programme also helped raise women’s wages across the labour market. Indeed between 1993-94 and 2011-12, the national gender wage gap narrowed by 3 percentage points and was largely attributed to MGNREGS and its introduction of a rural minimum wage, in this 2018 report by the International Labour Organization (ILO). Economists like Dewan recognise the scheme’s contribution and call for greater investment in the face of rising demand for work. “In the early years of implementation, you did hear of upper-caste men not allowing MNREGA to be implemented in some areas since gender equal wages were seen as ‘insult’ to the men, but on the whole, it has been positive,” she said. “We need it to not only continue but in fact strengthen, particularly in the context of agrarian distress… At the national level, we now have 53% of workers as women, with some states reporting almost two-thirds. While other government programmes such as the National Rural Health Mission and Sarva Shiksha Abhiyan (Education For All movement) have been able to provide occupational diversification for women, such as ASHA and Anganwadi (community health and childcare) workers, they have also perpetuated existing beliefs that social and care work can be remunerated at a lower rate, thus keeping women’s labour unequal. Despite the fact that 85% of Indian women are engaged in agriculture, no more than 13% own the land they till. Such dispossession and ‘landlessness’ means not only are women not officially recognised as farmers, but are also unable to access formal credit options that require asset-backed security, the report said. Correcting the land rights issue could be a first step to creating visibility around women’s farming work, as well as “improving their bargaining position and intrahousehold allocation of resources”, said Mehrotra. This would also produce a “multiplier effect” that could lead to “better social outcomes”, she added, with numerous studies showing that women invest up to 90% of their income in their children and families, including educational materials and nutritious food, compared to 30-40% of men. However, as of now, landless farmers remain excluded from government schemes that offer productivity generation provisions like subsidised seed prices and fertiliser. Delinking land ownership and farmer status, therefore, is a key way the government can help to improve infrastructure and institutional support, the report said. Many have also called for an affirmative action policy mandating 33% reservation for women in all public schemes supporting women farmers and which could raise their income level. “The state governments of Andhra Pradesh and Telangana have introduced rules whereby there are methods to identify all cultivators regardless of their land titles and ensure that they get access to government schemes,” said Ghosh, adding that there should be a “prerequisite” for women’s reservation in such schemes. While supporting the agriculture sector through increased public investment in irrigation, better storage and transport facilities is a “priority”, in order to raise equity and employment standards in rural areas, there is also a need to focus on non-farm employment generation and raising skill levels with publicly-funded training programmes, the report said. Any training programme targeting rural women workers should be “gender friendly”, given the patrilocal social norms governing women’s mobility discussed earlier. Providing transportation and childcare facilities as well as addressing barriers around cost and women’s domestic work responsibilities should all be considered.